Christmas is almost here and I am so excited! Our tree is up about a month earlier because our little peanut is amazed by anything that lights up. (And, who am I kidding – I’m perfectly okay with the extra cheer around the house this early!) We’re still working on getting the rest of the decor up, but there’s something about the lit up tree that puts a smile on my face every night it’s on. With Christmas just around the corner though, I’ve been thinking about what to give for gifts. We always try to give thoughtful, meaningful gifts to our loved ones. Gifts that have meaning to us and them and gifts that are exceptionally useful are my favorite. And this year? I’ve got the perfect gift for nearly all our family members. Let me share one thing about our family though. Some of them really enjoy the outdoors. They go boating, hiking, fishing, and have a cabin. They’re outdoor enthusiasts. Then there are some that, well, don’t really enjoy the outdoors. Glamping is about the closest they’ll get to the great outdoors. They’re the indoor enthusiasts. But the gifts I have in mind? These gifts all work for both indoor and outdoor fans. 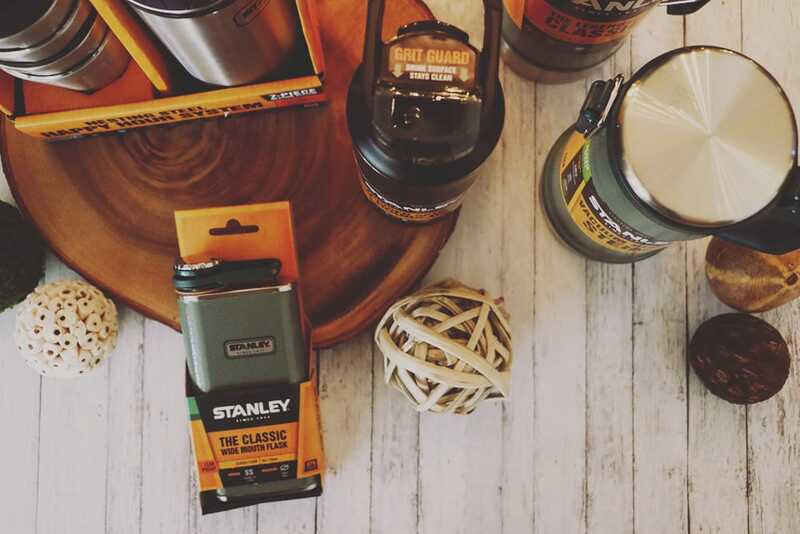 These Stanley-PMI products are seriously our go-to products for all of our outdoor adventures. They go EVERYWHERE with us. And we’ve made some awesome recipes inspired by them. S’mores Latte anyone? Or maybe some Cranberry Orange Vodka? Or a little Tropical Punch? Or if you’re feeling food instead, maybe this Potato Leek Chowder? 16oz Mountain Switchback: Not only is this leak proof, it also won’t rust and has a trigger action to release the liquid. Perfect to keep your beverage hot for up to 7 hours. Adventure Happy Hour System 4x: Also will not rust, dishwasher safe and nests together to save space when packed away. 24oz Classic Stein: With a latching lid and vacuum insulation, beer can be kept cold up to 9 hours. It also has a steel inner lid so no plastic comes in contact with your beer. Classic 1.1qt Vacuum Bottle: Keep your beverage hot or cold up to 24 hours with this leak proof, fully packable bottle. 8oz Classic Flask: With it’s wide mouth, you can easy fill and pour from this flask. You’ll never lose the cap with it’s integrated lanyard, too. I think these gifts will be such a huge hit this year. Men and women, indoor and outdoor enthusiasts – doesn’t matter. We have so many great memories of our adventures over the years that included our Stanley-PMI gear and I’m excited for our loved ones can create their own. 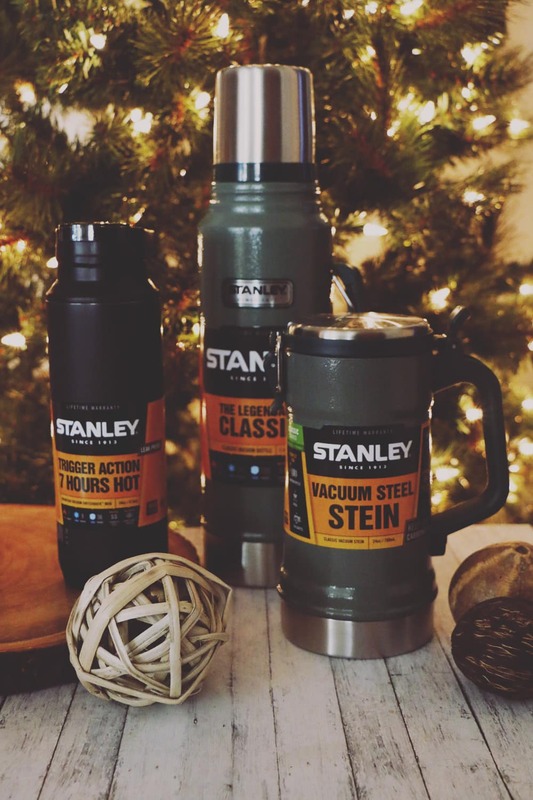 What are your favorite Stanley-PMI products? What gifts would you recommend for indoor + outdoor enthusiasts?